Nathan Carter was all of 21 when he released his third album, Time of My Life, in 2011. The album opens with the title track, a surprisingly effective cover of Green Day’s 1997 pop classic, with lovely Irish touches. His version of “Take Another Little Piece of My Heart” is a solid yet jarring interpretation of Faith Hill’s much-disparaged rendition of the song. The lyric, when taken from a man’s perspective, sounds oddly juvenile. Carter transforms Don Williams’ “Lay Down Beside Me” into a mid-1990s power ballad. His take, which I like, is so convincing I would’ve expected to hear it grace country radio circa 1995-1996. I’m not so keen on his reading of “Delta Dawn,” which he transforms into a bright country shuffle. He treats “Fishin’ In The Dark” well, but he’s no match for Jeff Hanna or Nitty Gritty Dirt Band. “Where Do You Go To My Lovely” was composed and originally released by British singer-songwriter Peter Sarstdet in 1969. The song is perfect for Carter, who wraps his vibrato around it gorgeously. The beautiful “My Forever Friend” is presented here as a duet with Charlie Landsborough, from who the song originates. “One For The Road” is an excellent and bright sing-a-long brimming with fiddle. “The Dancer,” a mid-tempo waltz, is just as wonderful. “The Rainbow in Glenfarne” is a moderately paced Irish folk tune that fits nicely with the other bright fiddle tunes on the album. The medley of “Spanish Dancer / Holy Ground / Westmeath Bachelor” might be more of the same sonically, but it’s the fastest track on the record and just a delight. I wholly recommend the album, even if I found the cover songs to be a bit subpar. As Paul pointed out, these songs are likely new to Carter’s audience, but to my ears they aren’t very good. But Carter possesses a lot of charm and has a strong voice, which carries the album over the finish line. Nathan Carter, born in Liverpool to Northern Irish parents in 1990, followed a similar path to that of Lisa McHugh. He moved to Ireland on his own at just 18 with the aim of making a career in country music. His very pleasing smooth tenor voice is ideally suited to both country ballads and Irish songs, with its lovely tone and timbre. The Way You Love Me, his second album (the first, Starting Out, was released when he was just 17), is a very assured and mature record from such a young artist. The title track is a likeable mid-tempo shuffle of a love song with a Bakersfield feel. This theme is revisited a little less successfully with a Buck Owens medley, which unfortunately ends up feeling rather karaoke; I feel tackling a single song would have worked better. Nor does he quite convince on the Nitty Gritty Dirt Band’s ‘story song ‘Face On The Cutting Room Floor’, although there is a lovely fiddle solo. ‘After All These Years’ is a lovely ballad, a cover of a song popularised by veteran Irish country duo Foster & Allen. The song really suits Nathan’s voice. The Patty Loveless hit ‘Mr Man In The Moon’ also works very well, allowing him to soar vocally. His take on Vince Gill’s ‘I Still Believe In You’ is just gorgeous and, perhaps surprisingly, rivals the original, although the orchestral arrangement is a bit too much in the later stages. Another nice cover is of ‘Break My Mind’, which was originally written by John D Loudermilk and had been recorded by dozens of country singers over the years, with Vern Gosdin’s version being the one I am most familiar with. Nathan’s version of the Gene Watson hit ‘Got No Reason Now for Going Home’ is also very good. ‘How Could I Love Her So Much’, a Johnny Rodriguez hit from the early 1980s, is another great song, in which the narrator has a little chat with his old flame’s new love. I also quite enjoyed a catchy version of Joe South’s ‘Games People Play’. ‘My Dear Ireland’ is a pretty Irish folk style paean to the country. Also in the same style is an enjoyably sprightly medley of ‘The Leaving Of Liverpool’, ‘Star Of The County Down’ and ‘Donegal Danny’, which is very entertaining and probably a live favorite. I was really impressed by this album. I like Nathan’s voice a lot, and if I had not known he was only 20 when this album was released I wouldn’t have believed it. Although the selected songs are all covers (with the possible exception of the title track), they are a well chosen group, and the arrangements are excellent. 2011 was a good year for Louisiana Born Irish country singer Robert Mizzell. He was inducted into the Shreveport Walk of Stars, which recognizes achievement in the world of country music, and is the highest honor his home city could bestow upon him. He also released his eighth album, Mama’s Rocking Chair, a collection of thirteen songs, many of which were classic country covers. Among the tracks are three George Jones songs from his years recording for Musicor. The earliest, “Things Have Gone to Pieces,” written by Leon Payne, was his first single for the label, peaking at #9. Mizzell gives an excellent reading of the ballad, which nicely stands up to Jones’ recording. The other two were culled from Jones’ 1970 album Will You Visit Me On Sunday. The title track, written by Dallas Frazier is about a prison inmate and the woman he loves on the outside. Charlie Walker’s “Rosie Bokay,” tells the story of a man falls for an enigmatic bartender. Both are also excellent and devoid of the intrusive touches on Jones’ versions. The jaunty “Sick, Sober and Sorry” was a duet for Lefty Frizzell and Johnny Bond in 1951. Mizzell reprises it here, beautifully, as a duet with Martin Cleary. John Prine’s “Grandpa Was A Carpenter” is newer, first seeing release by him in 1973 and again in 1989 from The Nitty Gritty Dirt Band on Will The Circle Be Unbroken, Vol. 2. Mizzell once again turns in an equally wonderful performance. Also very good is his version of Rodney Crowell’s “Leaving Louisiana In The Broad Daylight,” which came to prominence through recordings by Emmylou Harris and The Oak Ridge Boys. The plight of Irish immigrants in the 1950s is covered on “Paddy,” an Irish folk ballad given a traditional arrangement. Also gut wrenching is “The Orphan Train,” a brutal ballad. The title track, a mid-tempo fiddle drenched ballad, is another excellent story song. “What We Don’t Have” and “Can You Hear Me Now” are pure honky-tonk. Also featured on Mama’s Rocking Chair is Mizzell’s biggest hit to date at the time, the upbeat “I Ain’t Fallin’ for That” and “Cajun Dance,” a fiddle heavy ode to his Louisiana heritage written specifically for him by Peter McKeever. Of the two,“Cajun Dance,” which opens the album, is the stronger song, which recalls the line dance craze of the early 1990s. Mama’s Rocking Chair, as a whole, does a great job of mixing both old and new cohesively. I thought it was a bit too clean and precise in execution, but it’s a fine album worth checking out. Individual tracks are available on YouTube and the album is also on Itunes. Mixed artist compilations can often be hit and miss. This concept album based on life in the American South, produced by Dave Cobb, is no exception. The concept itself hangs together a little vaguely, and the artists come from country and Americana with a side of (white) soul and rock. However, if it is intended to represent the South as a whole, it is rather lacking in the ethnic diversity of participants. Jason Isbell is normally more Americana than country, but ‘God Is A Working Man’ is definitely a country song, and an excellent one to boot. The lyric pays tribute to a working class family with lots of colourful details about a Pentecostal preacher and his son. 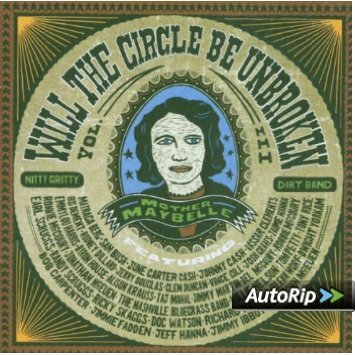 The melody and rustic vibe remind me of ‘Grandpa Was A Carpenter’, as recorded by the Nitty Gritty Dirt Band and John Prine on Will the Circle Be Unbroken Part II. I like it better than any of Isbell’s past recordings. Brent Cobb is producer Dave’s cousin (actually, first cousin twice removed). His track, ‘Down Home’, is quite pleasant without being very memorable. I also quite enjoyed Holly Williams’ ‘Settle Down’, about starting a new family. I tend to prefer Miranda Lambert when she isn’t rocking it up, so I enjoyed her song, ‘Sweet By And By’ – not the gospel classic but a reflective depiction of rural life and family philosophy which sounds as though it was written for the prompt of the album concept. The old fashioned folky lyric and vocal are charming, although a more stripped down arrangement would have been even better. ‘Learning’, by Miranda’s new boyfriend, Anderson East, an Americana/R&B artist based in Nashville, is not my style of music, but is pretty good of its kind. Shooter Jennings’ ‘Can You Come Over’ is in similar vein, but more listenable. Rich Robinson of the rock band the Black Crowes offers a loud and boring number. John Paul White’s former duo the Civil Wars were much admired by many critics, but they were never quite my thing, and I’m afraid I strongly disliked White’s whispery tune here, ‘Simple Song’. Not all the songs here are new. Zac Brown (who appears to have lost the plot on his last album) is back on form here with a nice cover of Skip Ewing’s ‘Grandma’s Garden’. Lee Ann Womack adds a sweet harmony. Jamey Johnson wrote the tender ‘Mama’s Table’ for the Oak Ridge Boys a few years ago, and revives it here himself. The song remembers childhood happiness. Brandy Clark has recorded the affecting ‘I Cried’, about a family funeral, before, but it fits neatly in the theme for this collection, and she sings it beautifully. Morgane Stapleton, wife of Chris, once had her own record deal, although nothing was ever released. She has a very pretty voice in the vein of Lee Ann Womack or Dolly Parton, so I was disappointed that her contribution (backed by Chris) was not really to my taste. It is a dramatically slowed down blues/rock take on the oldie ‘You Are My Sunshine’ which sounds suicidally depressed. This is a bit too varied for me as a whole, but there are several worthwhile tracks. 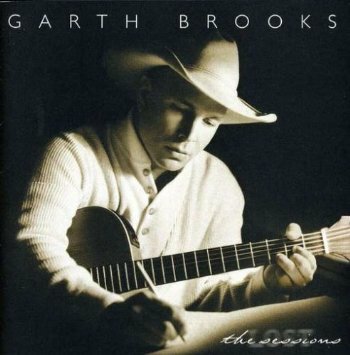 In 2005 Garth came briefly out of retirement with the release of a lavish box set exclusive to Walmart, which included one disc called The Lost Sessions, a collection of offcuts from previous records with a handful of new songs. This was subsequently given a separate release with added tracks. Opener and lead single ‘Good Ride Cowboy’ is a tribute to rodeo rider and cowboy singer Chris Ledoux, who was so famously namechecked in Much Too Young (To Feel This Damn Old)’ at the start of Garth’s career, and who had died earlier that year. He launched the song on an unsuspecting world live in Times Square, New York, during the CMA awards show, and that gave the single enough impetus to send it racing up the charts. An eventual peak of #3 made it Garth’s biggest hit since 1998. Garth did not actually write the song himself; the writers include later hitmaker Jerrod Niemann. He and Steve Wariner are among the chorus of backing vocalists on the rowdy tune. It was followed by a duet with Trisha Yearwood, to whom he was now married. ‘Love Will Always Win’, which had been recorded in 1999. It is a pleasant enough but rather bland song, and only reached #23. The third and last single, the fiddle-led ‘That Girl Is A Cowboy’, was a new Garth co-write with Niemann and Richie Brown, two of the writers of ‘Good Ride Cowboy’. It’s quite a nice song, and the arrangement makes it one of Garth’s most traditional country records. ‘Under The Table’, another Garth song (written with Randy Taylor) may date back to the recording sessions for his self-titled debut. It is an excellent song in traditional vein, a pained ballad about trying to drink away a memory. A breezy cover of the Nitty Gritty Dirt Band’s ‘Fishin’ In The Dark’ is also very enjoyable. Five songs have copyright dates of 1996-7, three of them Garth co-writes, and I suspect they are rejects from the Sevens recording sessions. ‘Allison Miranda’ (a Garth co-write) is a pleasantly understated story song about picking up a hitchhiker and falling in love. The heavily strung and very short (less than two minutes) ‘American Dream’, which he wrote with Jenny Yates, is a gentle ballad about growing up in America, which feels like an unfinished first draft, consisting of only two short verses disguised by an orchestra. ‘Meet Me In Love’ is a loungy jazz style number. My favourite of these tracks is DeWayne Blackwell’s ‘Please Operator (Could You Trace This Call)’, a solidly country and entertaining drinking song about a man who’s consumed so much to forget his troubles that he has no idea where he is. I also very much like Bruce Robison’s catchy ‘She Don’t Care About Me’, one of three songs Garth subsequently passed on to his former sideman Ty England for the latter’s 2000 Garth-produced Highways and Dancehalls album. The pleasant Tex-Mex ‘My Baby No Esta Qui No More’ is also enjoyable, but ‘I’d Rather Have Nothing’ is a bit cluttered and just okay. Alison Krauss harmonises on the chorus of ‘For A Minute There’, a gently melancholic tune about a remembered romance which dates from 1999, and which Garth wrote with Kent Blazy. 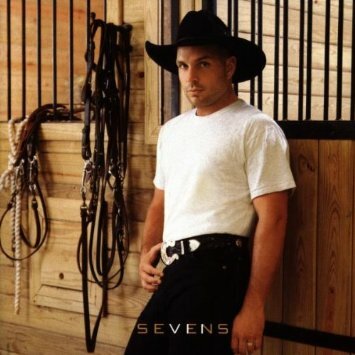 The western swing ‘Cowgirl’s Saddle’ is an attempt at quirky humor from 2001; I enjoy Garth doing this style and it sounds great musically; but the lyric (another of his co-writes) is a bit off-color. Dating from 2002, Steve Wariner and Marcus Hummon’s ‘You Can’t Help Who You Love’ is a self-justifying cheating song which is quite good, but over-produced. The brand new ‘I’ll Be The Wind’ is plain dull. The set closes with a delicate reading of the 1950s anti-war folk song ‘Last Night I Had The Strangest Dream’. This is a very varied, if not terribly cohesive album, with elements of most of the styles Garth has pursued over the years. It certainly wasn’t worth buying the original boxed set for, but is a better bet as a standalone especially now that used copies are available relatively cheaply. The Nitty Gritty Dirt Band’s Jeff Hanna and his wife Matraca Berg wrote this song, which is probably best known from Rascal Flatts’ cover.